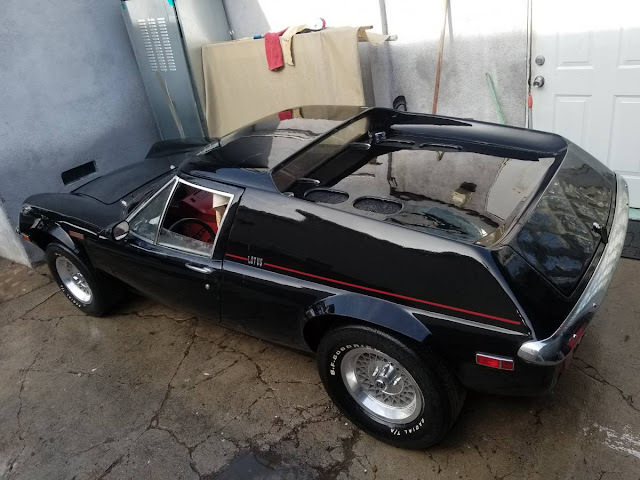 The Lotus Europa has always been a favorite car over around these here parts -- we DT writers love its lightweight composite chassis, mid engine high revving powerplant and cheap entry price. Time has driven the nicer examples to higher prices, but you can still get nice cheap Europa for the price of a 911 rear bumper mounting flange and we think the Europa is sweet. Find this 1970 Lotus Europa S2 offered for $7450 in Long Beach, CA via craigslist. Tip from Hugh. 1970 lotus Europa. complete car. barn find. this running / driving car was taken off the road over 30 years ago, in order to be restored and upgraded. 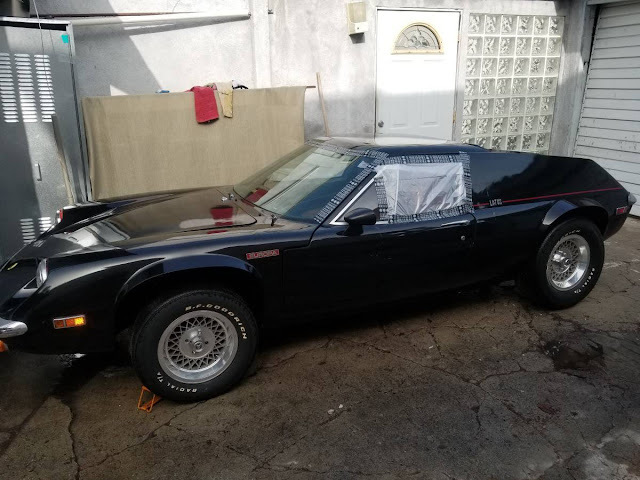 the body and paint work was completed, the interior re-upholstered, Monza exhaust purchased, new aluminum wheels and BFG tires were installed, fog lights added, custom made headers, wood dash and air conditioning were started into production but, never completed. the car sat safely indoors for over 30 years like this. the engine spins, but will need wiring and spark to run, exhaust and wiring. the paint is shiny. very nice body, upholstery is very nice. original or modified dash and electrical will need finishing, as well as some of the trim and engine bits. frame and suspension points are all very solid. this is an assembly project.....not a restoration project. the hard work has been done. this will make a stunning car. wheels and tires look and are new because they are....only 30 years old! the car was stored properly. one of the two gas tanks is missing, windshield moldings, speedometer not either, otherwise looks extremely complete. a cool time machine. clean title in hand. possible automotive trades considered. worldwide shipping assistance available. principles only. firm price. text or email only please. Nice find , all these really early S2s popping up. On a lotus, the paint and interior are probably the high priced items and this one looks really good. No photos of the seats or doors ( roll down windows yes or no?) in the white car. That said, black is about the last color I would pick for an Europa between visibility and ventilation. The Europea badges on the front fenders are kind of tacky on the black car. Funny that the white car shares space with a 914 which has a tardis like ratio of wide open space inside a small exterior. I find a Boxster uncomfortably small compared to my 914. I wonder if someone bought an Europa thinking it was about the same size as a 914 without trying it on first. Hey, that white car in Calgary Canada is an even better deal now: relisted at $4875 USD ($6500 CanuckBucks). Probably hard to go too far wrong. Regarding the black car, I bet those wider wheels and tires mess up the go-kart handling of the Europa. Colin Chapman probably knew best.... Much nicer interior than the white car, however. Please make sure you can fit in before you buy or bid on it. I always loved these cars, but when I found a reasonably priced one, I could not fit in and entry and exit was even harder. i am 6 FT, 185 lbs. It might have been an S1 that you didn’t fit in. They are a bit smaller than this S2. I am almost the same size 6’ 175lbs, 31 in inseam and size 10 shoes. Fit very comfortably in my S2. Agree that black is not the color for these little things. Along with the paint and interior for cost is the frame. If it is rusted out they are costly. Very simple to work on but your back will be killing you. When they are running right they are an absolute blast. Europas, 914’s, TR3’s, and X1/9’s are all in the same boat for me. Small but relatively comfortable once seated, and you can toss them around for hours of fun without a lot of effort. I have NEVER said this before on DT - A Lotus Europa project that doesn't run? Unheard of. Just noticed those flares, eww. 30 year old tires look great. Just don't drive anywhere on them.